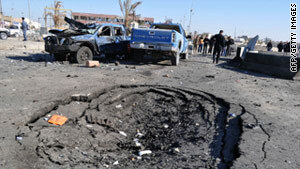 Nine people, including four police officers, were killed in this attack in western Iraq's Anbar province last month. Baghdad (CNN) -- The total number of Iraqi civilians and security forces personnel killed in violence in 2010 was higher than in 2009, according to a CNN tally based on figures released throughout 2010 from Iraq's defense, interior and health ministries. A total of 3,605 Iraqi civilians, police and army members were killed last year, compared to 3,479 killed in 2009. According to CNN's tally, the number of Iraqi civilian deaths dropped in 2010 compared to the previous year, but the rise in the overall death toll was due to an increased number of Iraqi police and army personnel killed. According to CNN's tally, a total of 2,505 civilians were killed in 2010 -- down 304 from 2,809 in 2009. But 1,100 security forces personnel were killed in 2010 -- up 430 from 670 in 2009. Iraqi security officials attribute the increased number of casualties among Iraqi police and soldiers to Iraq conducting more security operations on their own, as the United States has decreased the number of troops it has in the country and shifted its focus from combat to training and advising Iraqi troops. Figures compiled by Iraq's defense, interior and health ministries showed 89 civilians, 41 police and 21 soldiers were killed in December 2010 -- the lowest number of deaths in a month since November 2009. Meanwhile on Sunday six people were killed and 17 others were injured in separate attacks in Iraq, according to officials. The most severe attack occurred at the home of a judge outside Balad, about 70 kilometers (44 miles) north of Baghdad. According to police, gunmen planted a number of improvised explosive devices around the home of Balad Chief Judge Hardan Khalaf Jasim early Sunday morning. Jasim's nephew was killed in the ensuing explosions while Jasim was critically wounded, police said. The attack caused severe damage to the home. Eight other family members, including Jasim's wife and sister-in-law, were also injured, according to police. Elsewhere, an Iraqi soldier and two civilians died when a car bomb exploded near an Iraqi army patrol in the town of al-Qaiyara, about 50 kilometers (31 miles) south of Mosul, according to Mosul police. Four Iraqi soldiers were wounded in the incident about 4 p.m. Sunday (8 a.m. ET). Mosul is about 420 kilometers (260 miles) north of Baghdad. In eastern Baghdad, gunmen opened fire on a vehicle carrying two members of the Shaheed al-Mihrab Shiite institution, killing one person and wounding another, an Iraqi interior ministry official told CNN. The institution belongs to the Islamic Supreme Council of Iraq. In another incident, gunmen attacked an Iraqi police checkpoint in western Falluja, killing a police officer and wounding three others, Falluja police told CNN. Falluja is about 60 kilometers (37 miles) west of Baghdad.